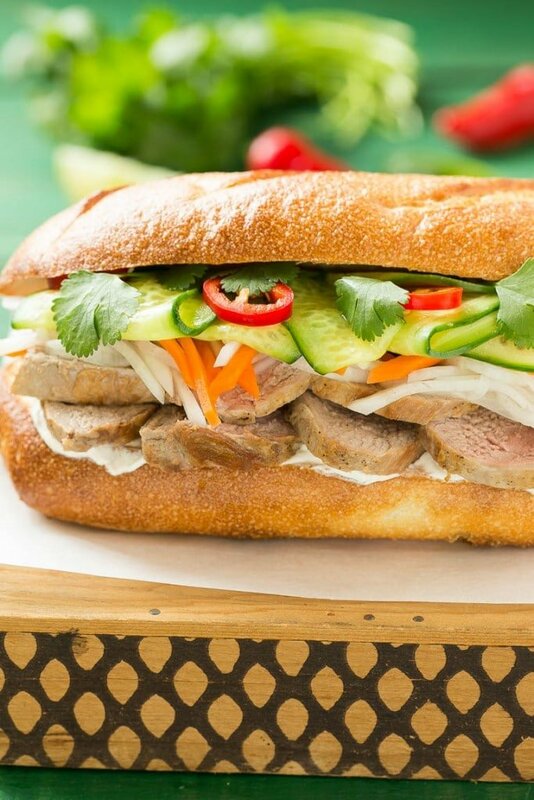 This recipe for a bahn mi sandwich starts with a crusty french roll that’s then piled high with tender slices of pork, pickled vegetables and fresh herbs for a hearty meal that’s full of flavors, colors and textures! Skip the sandwich shop and make your own bahn mi sandwiches in the comfort of your own home! We are a family of sandwich lovers – it’s not uncommon for sandwiches to be on the menu on nights where I don’t feel like cooking. This Vietnamese bahn mi sandwich is a little more exotic than your typical ham and cheese or peanut butter and jelly, but it’s surprisingly easy to make. This is not a 100% authentic version of the traditional recipe, but it’s one that everyone over here enjoys (hold the chiles for the kids!). How do you make a bahn mi sandwich? The first component of this bahn mi sandwich is the bread – you’re going to want to go for a french baguette or something similar. The bread is toasted, then spread with a generous layer of mayonnaise. The sandwich is then piled high with thinly sliced seared pork tenderloin. While your pork is in the oven roasting to perfection, it’s a great time to prepare the vegetables. I made a quick pickling solution out of rice vinegar, sugar and seasonings for the shredded carrot and daikon radish. I also thinly sliced some cucumbers and red chilies. Add a few cilantro leaves on top and you’ve got sandwich perfection! If you’re not into spicy, it’s totally fine to omit the chiles. My local grocery store carries daikon radish, it looks like a long white root vegetable. If you can’t find it at your regular grocery store, try an Asian market. This bahn mi sandwich recipe is most definitely going into our regular dinner rotation – how could it not?! All those flavors and textures are a great way to to make lunch or dinner something extraordinary without a ton of effort. 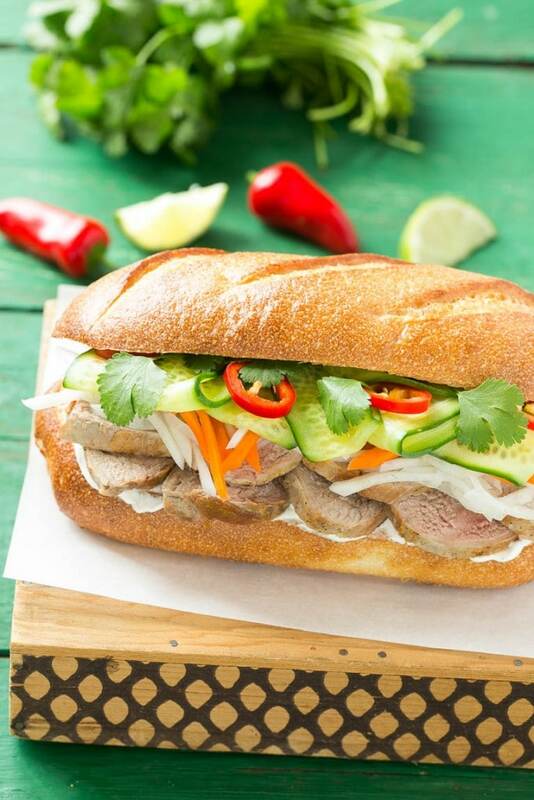 This recipe for a bahn mi sandwich starts with a crusty french roll that's then piled high with tender slices of pork, pickled vegetables and fresh herbs for a hearty meal that's full of flavors, colors and textures! 4 pieces long french rolls or 1 baguette cut into 4 . Bread should be split lengthwise. Combine the rice vinegar, sugar, water and salt; stir until thoroughly mixed. Add the carrots and daikon radish and toss to coat. Set aside. Preheat the oven to 400 degrees Heat the olive oil in a large pan. Season the pork tenderloin generously with salt and pepper. Add the pork to the pan and sear on all sides until deep golden brown, about 5 minutes per side. Place the pan in the oven and cook for 6-8 minutes longer, or until desired level of doneness. Remove the pork from the oven and let it rest for 5 minutes. Thinly slice the pork. Spread the mayonnaise evenly over the bottom pieces of bread. Divide the sliced pork evenly between the sandwiches. Top the pork with the picked vegetables, cucumbers, cilantro leave and chiles (if using). Place the top piece of bread on and serve immediately. Omg this recipe looks amazing!!! I would love to try it 🙂 just one thing though, you spelt “banh mi” wrong. I am actually Vietnamese. Thanks Thuy! What is the correct spelling? Amazing looking sandwich! It’s going on my menu next week! 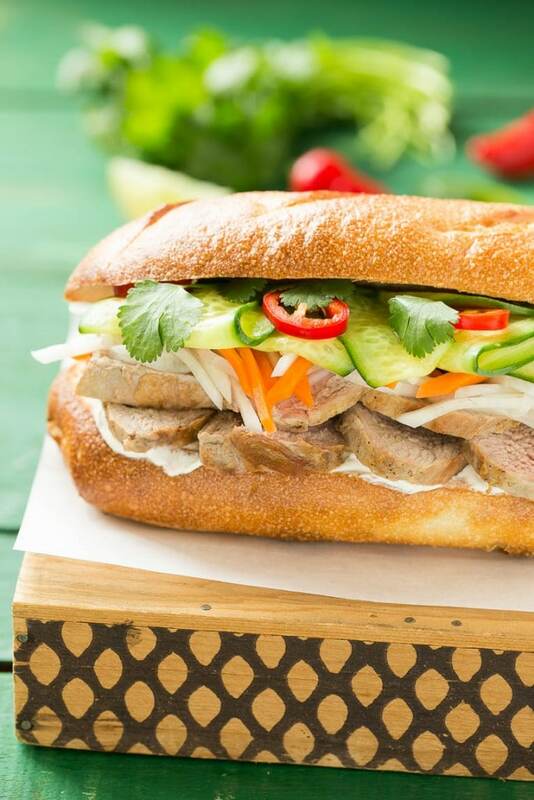 Sara, I lvoe your take on the Bahn Mi–totally putting this on my meal plan! SUCH a good idea for an easy, delicious weeknight meal that’s little fuss! We hardly ever eat sandwiches, but when I see recipes like this, I realize that it’s totally do-able and something I should do more often to change up our dinner game! wow this sandwich looks like a perfect option for using pork loin leftovers of for a party. Loving all the combination of flavors yummy! That sandwich looks amazing. I want one with chilies. omgoodness, this looks AMAZING! Pinning for sure! I absolutely love a good bahn mi sandwich. And they are hard to come by! Too many restaurants try to “make it their own” and only fail by ditching the traditional flavors–which is what makes it so great in the first place! This one looks spot on. Have to try SOON! This looks way better than any sandwich you would get at a franchise (and I would know after working at one for years!) Fantastic! I wish my family were sandwich lovers. Sandwiches always win! Across all cuisines! I love the pickled veggies!